This entry was posted on Thursday, January 1st, 2015 by Frances Ryan. In addition to my general New Year’s resolution to be more optimistic and hopeful, I have set myself a few goals to reach over the year. I’ll talk about some of them from time-to-time, some might never be talked about but will be written down, and some will remain within my own mind, known only to me. If you’re a regular Just Frances reader, it won’t surprise you to know that one of the big “talked about” goals will be my running goals. So, here goes! 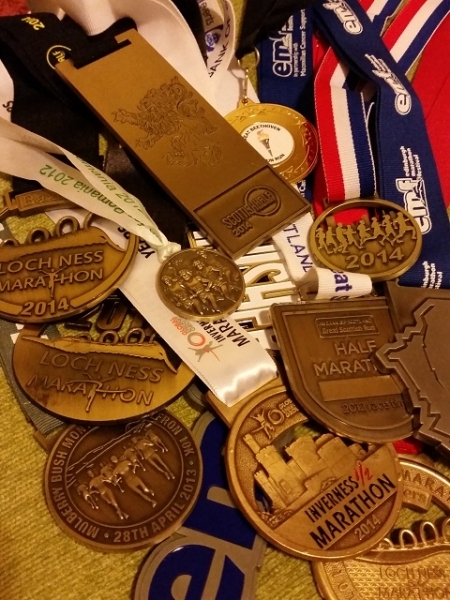 My 2015 running goals are to shave 20 minutes off my best marathon time and 15 off my last half marathon time*. That means a goal of a sub-4:48:37 marathon and a sub-2:07:08 half marathon. I’m pretty excited about these running goals because I think they’ll help me to achieve my on-going goal of staying as healthy as possible for as long as possible—something that is a bit tricky with two major medical conditions. Still, a bit of hard work is a good thing! To help with these goals, I will work to create a better training regime (as in, I will actually train!) and will focus on my diet a little better. I know that both of those things will help me in so many ways—including improving my overall focus, which will do wonders for my PhD studies! Of course, the weather has already provided me with a perfect lame excuse not to do a training run today. But I am still on track for a nice, healthy day of eating (if you don’t count the obligatory New Year’s Day Bubbles). If anyone’s up for joining me for a race—or on a training run—this year, please get in touch! You’d be more than welcome to pant along with me! * I don’t think it’s reasonable to shave 15 from my best half marathon time right now (which would give me my desired sub-2:00:00) but I will certainly keep that as a stretch goal for the year. You never know!